A week after a gambling “experiment” was shut down in Sanya, Hainan, investors in Hong Kong were having meetings on how to pursue their plans to develop casinos in the southern Chinese island, known as the Hawaii of China, despite the set-back. According to gaming insiders, Jester Bar owned by “the colorful” art, film and real estate mogul, Zhang Baoquan, wasn’t the only operator “licensed” to test the cashless casinos. Our sources told us that “up to 10 licenses were issued or were about to be issued,” when Jester’s was shut down apparently following a Reuters’ dispatch revealing the activities of the casino bar at the Mangrove Tree Resort World. Inside the Macau-inspired gaming hall, with 50 tables, punters could play Baccarat, Black Jack, Poker and Sic Bo (Big & Small) enjoying all-purse betting limits ranging from as low as RMB20 to as high as 100,000 at VIP tables. One Mangrove chip costs RMB1, but chips cannot be cashed out, only traded for accommodation, luxury goods, jewelry and artwork for sale at the resort. When the news broke out, an MDT reporter was vacationing in restive Sanya. Our reporter then visited the hotel, looked around and queried some staff and guests about Jester’s and the “experiment”. 2. If you still have chips, please go to the bar reception to change them into credit tokens [vouchers to be used in the hotel]. 3. If you still have an entrance ticket to the bar purchased on the 18/02/13, exchange it for vouchers/tokens before 20/02/13 17:00. At that time, brochures promoting the cashless casino were still being handed out at Sanya airport, in Chinese, English and Russian. People in Sanya may not be able to afford to gamble, but apparently many have been well aware of the “experiment” and the bold government plans. A former Galaxy Macau executive, Eric Coskun is managing the casino operations at Jester’s and was subsequently “advised to keep a low profile”. MDT couldn’t reach him or other managers at the hotel for comments as nobody is responding to calls on the Mangrove Tree hotline. Hainan is purported to have the most illegal gambling operations in China. Despite the denials from Sanya’s government stating no gaming operations were ever officially sanctioned “it’s obvious that Zhang Baoquan has had the tacit approval of central government officials, even if only by turning a blind eye on the tycoon’s operations,” a gaming expert told the Times. Zhang – ranked by Forbes as one of the country’s 300 richest people last year – started to develop the idea of opening a casino bar in 2010 after the State Council decided to promote tourism in Hainan. The Mangrove Tree Resort World will be China’s biggest resort by the time construction is completed next year. 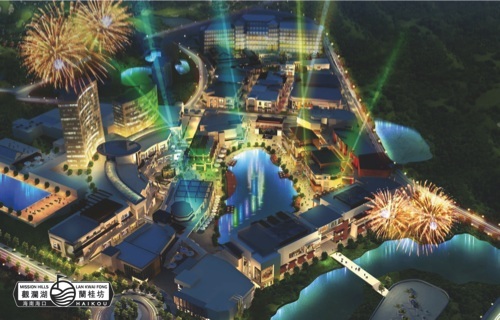 It will have more than 4,000 rooms, a convention hall accommodating 6,000 guests, more than 20 luxury retail shops and facilities including a water park. On Sanya’s shores other resorts are developing. MGM opened there in February 2012 with “over 4,000 square meters of technologically advanced flexible meeting space” and Caesars is scheduled to open in 2014. “They chose Hainan to commence their foray into China, and the question is, why would American companies such as these open hotels on Hainan? They both appear very sensitive in their statements about emphasizing their non-gaming focus. They doth protest too much, methinks,” said a gaming consultant. A golf course, 300 brand-name shops, 168 spa pools, innumerous international restaurants, a cinema multiplex, more than 1,000 rooms are the major features of the huge property comprising four hotels operated by the Ritz Carlton, Renaissance, Mission Hills and others. Construction has already begun with completion expected in the 3rd quarter of 2013. Investors from Macau, Hong Kong and elsewhere are salivating at Hainan’s tourist dollars. No wonder: In 2011, the Hawaii of China logged 30 million overnight stays, according to official numbers. For now, Hainan is competing with Hong Kong and Macau more as a luxury retail destination for mainlanders – while gambling legalization is not in view.